Our dream home is becoming a reality! And, boy is it taking a lot of sweat, determination and hard work! This is a time to be thankful! We are thankful to everyone who is making this dream happen for Bill and me. We are thankful for God providing us with the means to find and purchase this lovely piece of land to share with our family. We are thankful for our son Bryan who is encouraging us from afar in this venture even though he won’t be living close by. 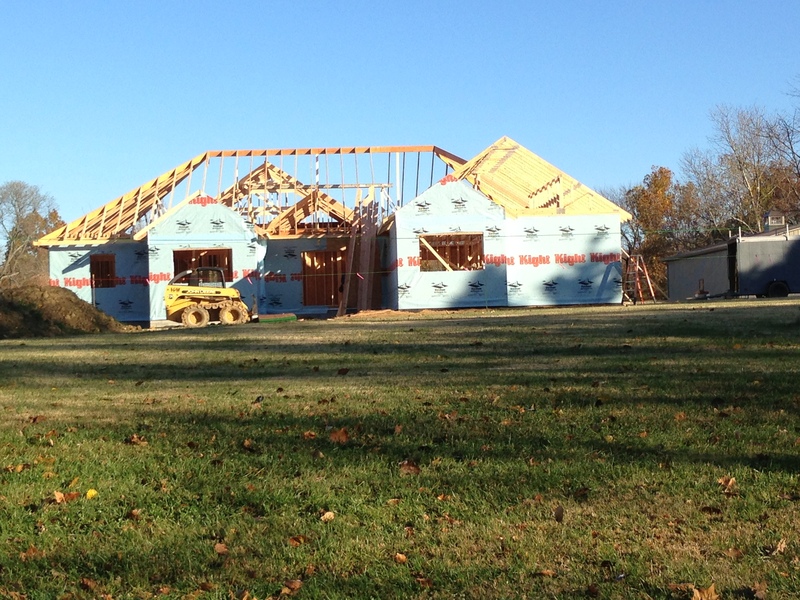 We are thankful for Jill and Jim for giving us a place to live while we are building. We are thankful for Jim who is spearheading the construction of our home and finding all those little things that we might not even think of because we don’t have that knowledge to find those things! We are thankful for Jill who is handling the financial side of the construction by keeping up with the bills and software! We are also thankful to Jill for helping us envision how things will look and honestly telling us if something doesn’t look right. 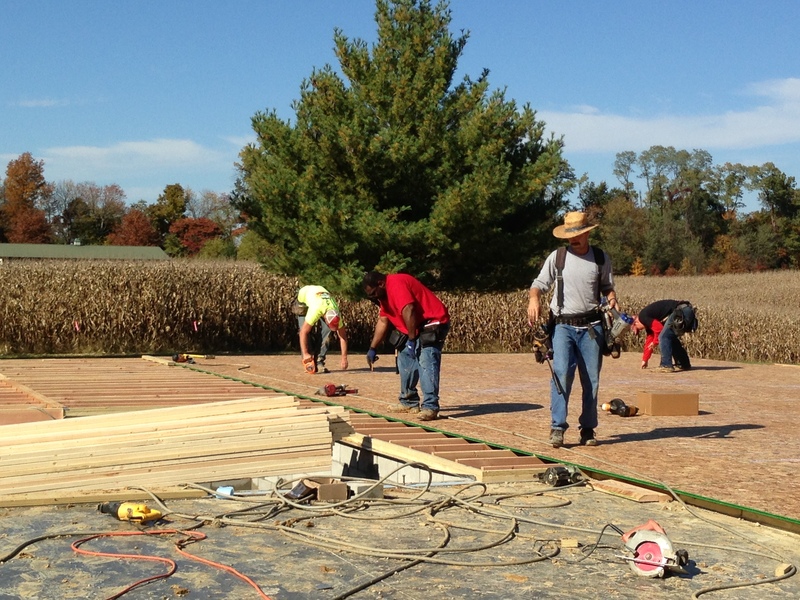 We are thankful for Jim, Sr. and Joan for letting us use their construction company for this endeavor. We are thankful for Jim, Sr.’s advise and expertise in structural engineering. 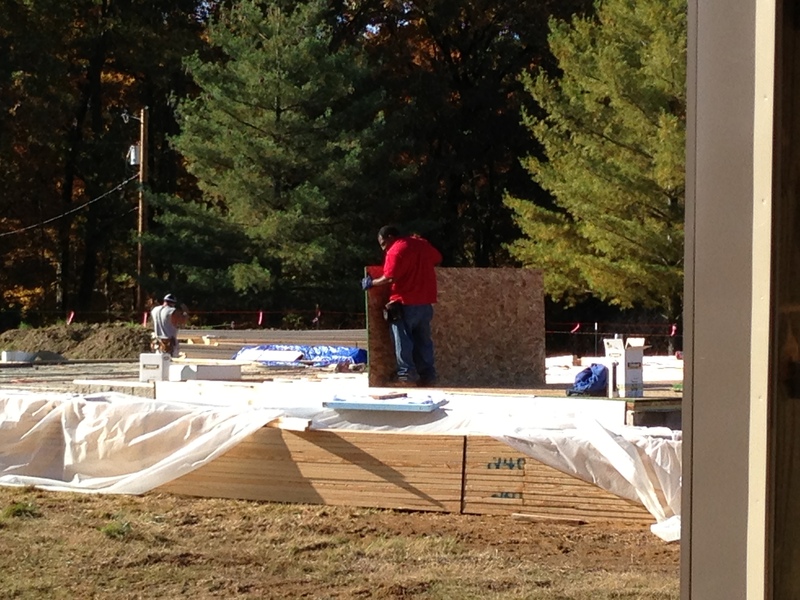 We are thankful for having great subcontractors so far! And, lastly, I am thankful for Bill – who has worked over and above on this project by doing all the PITA jobs, keeping contact with all the subs via email and phone, cleaning the construction site, burning the excess wood, and working on the cabinets when he has time in-between all the other jobs. We’ve had a lot of progress since I last posted. 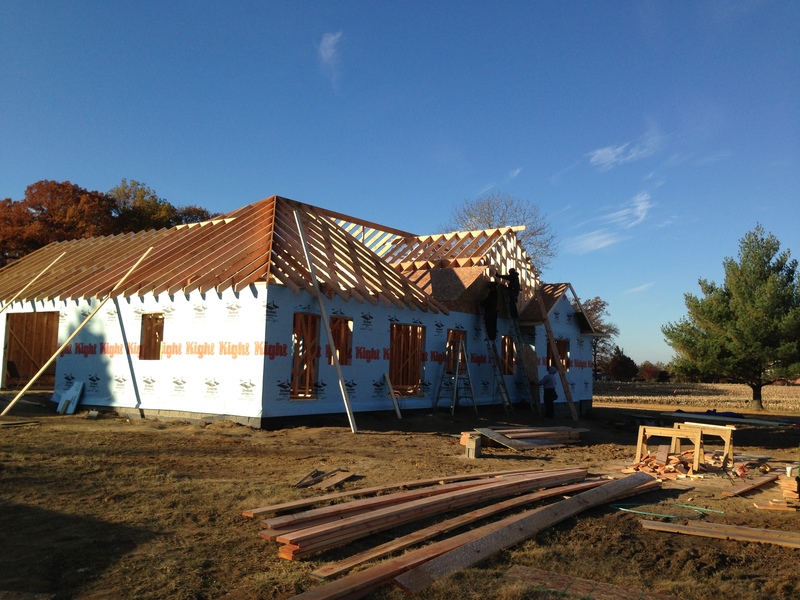 The framers thought they were going to finish on Wednesday, Nov. 13, so Bill scheduled the roofer to come on Friday, Nov. 15. 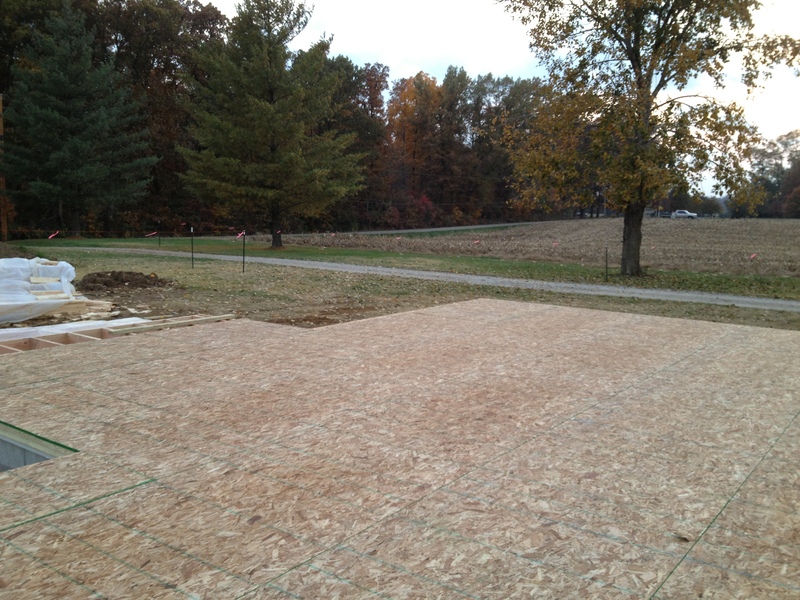 Well, the framers worked long hours into the dark several days but didn’t finish until Friday afternoon. 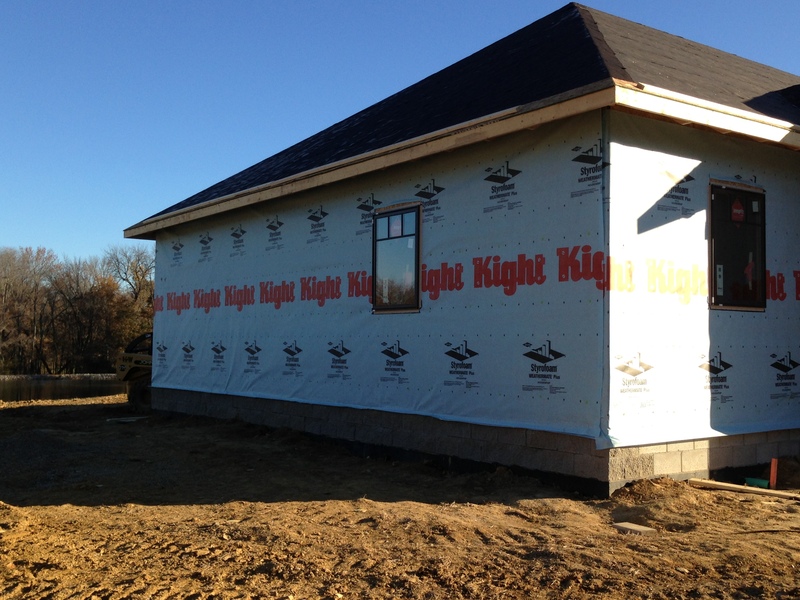 We had a full house on Friday with the 5-man framing crew, a large roofing crew, and the roofing material company delivering the shingles. 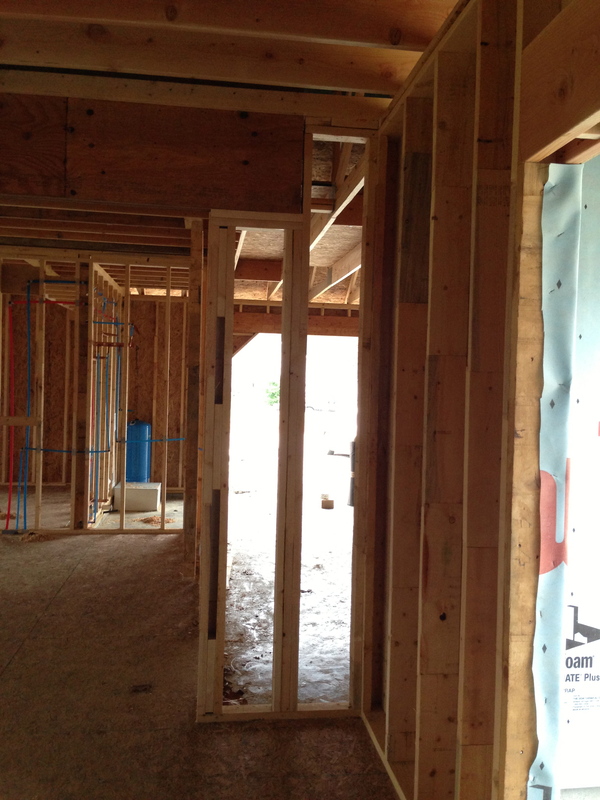 In addition, the HVAC and insulation guys came out to do walk-thru’s. And, of course, each of these people drove their own cars or trucks. They were parked all along our driveway and Jill and Jim’s driveway. 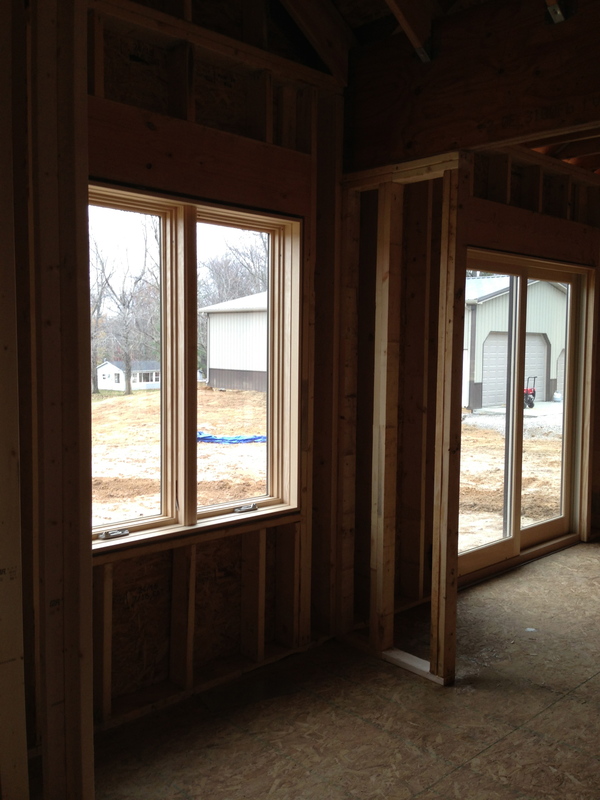 Here are some pictures of the exterior framing. 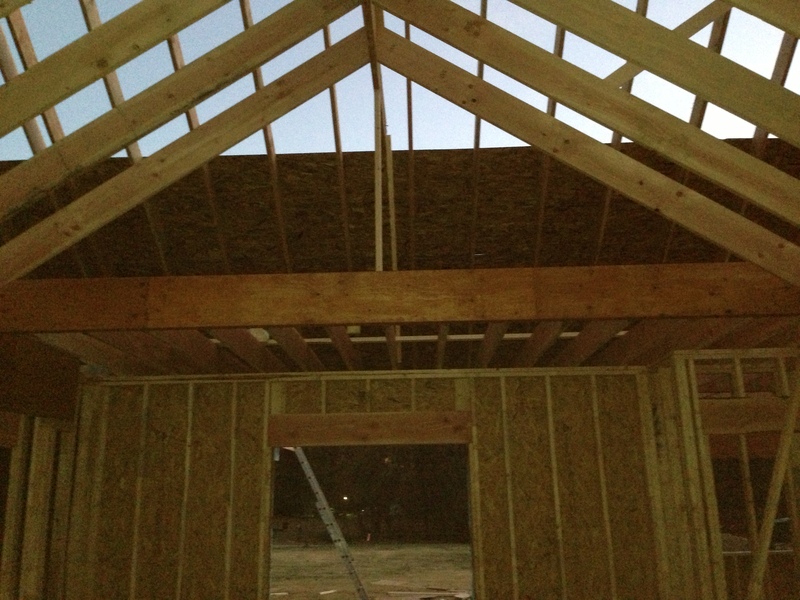 I loved when the framers put the sheet rock on the roof. Finally, I thought the exterior of the house looked like the elevation drawings of the house that Jim drew up for us. 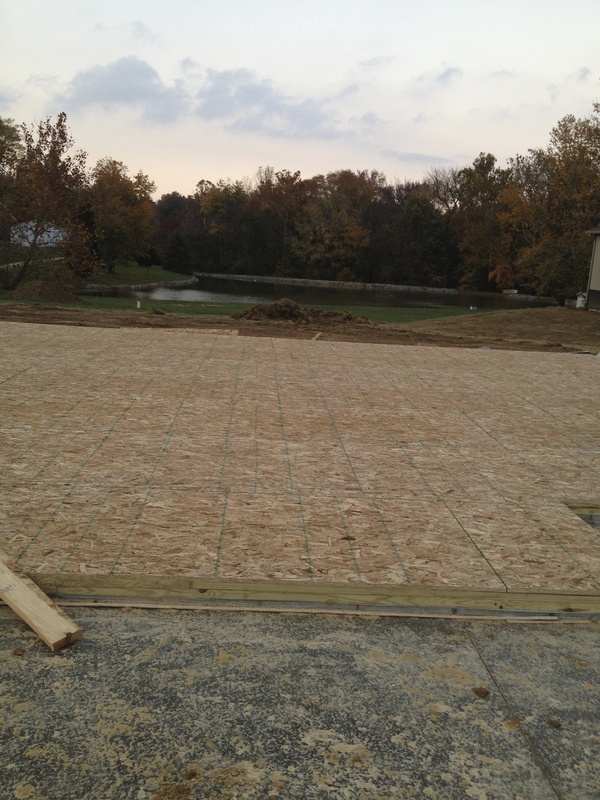 This is what the guys got done by the end of Wednesday, Nov. 13. 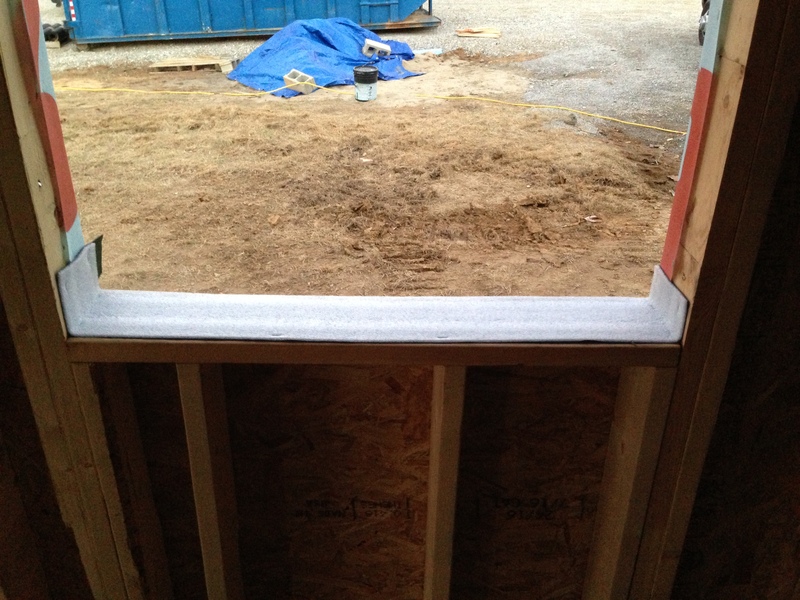 It was suggested we install some weather-stripping prior to the framers installing the windows. Alrighty then, who installs that? Hmmmmmm. 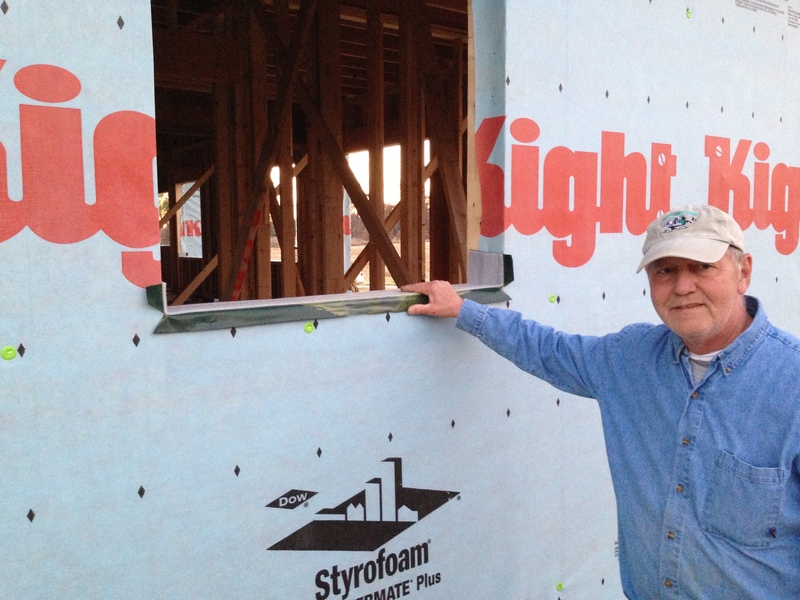 While the framers finished the roof, Bill worked on his next PITA job – installing the weather-stripping. Bill did say it wasn’t that bad of a job. Bill showing off his work. 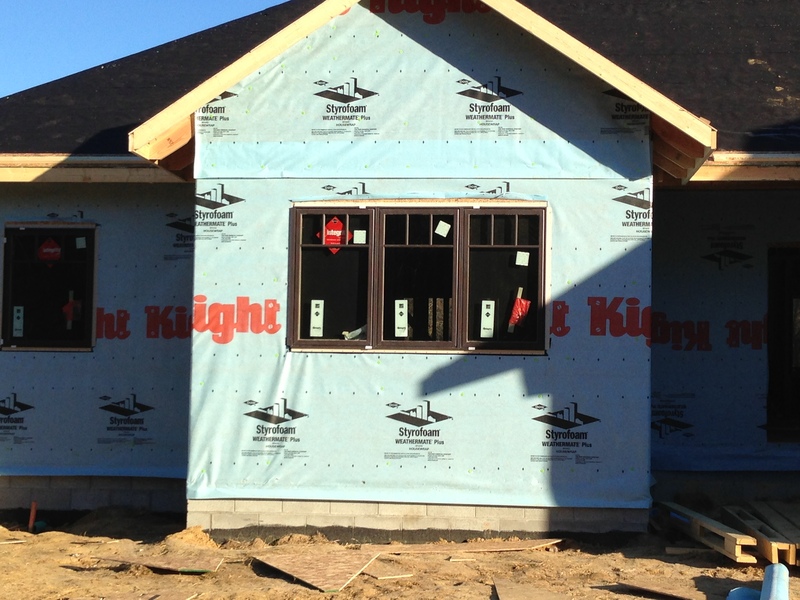 Thursday, Nov. 14, the framers installed our windows. Those went in really quick. 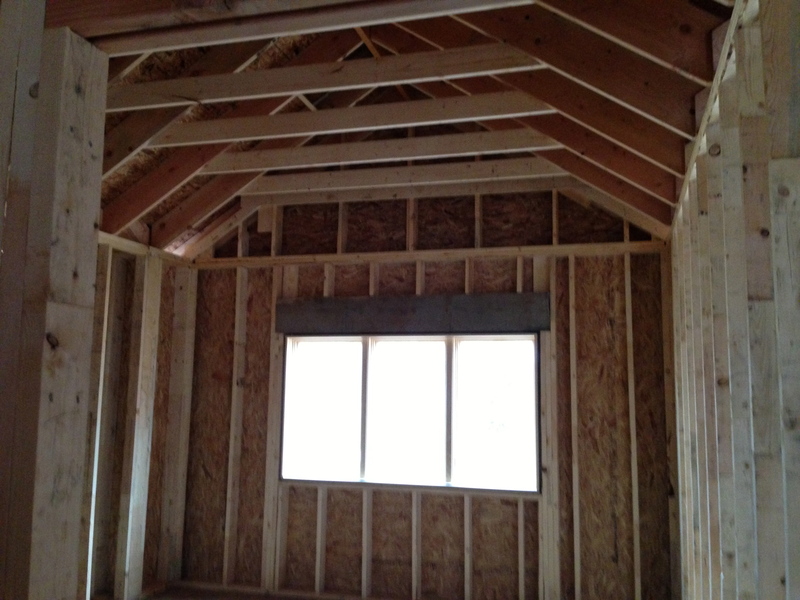 We had to go over with Greg (the framer) the height we wanted our vault to go in the family room and bedroom. Greg put up a board in the master bedroom to get my approval. The height on the flat center turned out to be about 10-1/2 ft high. Perfect! The vault would go up 18 inches from the 9 foot ceiling. 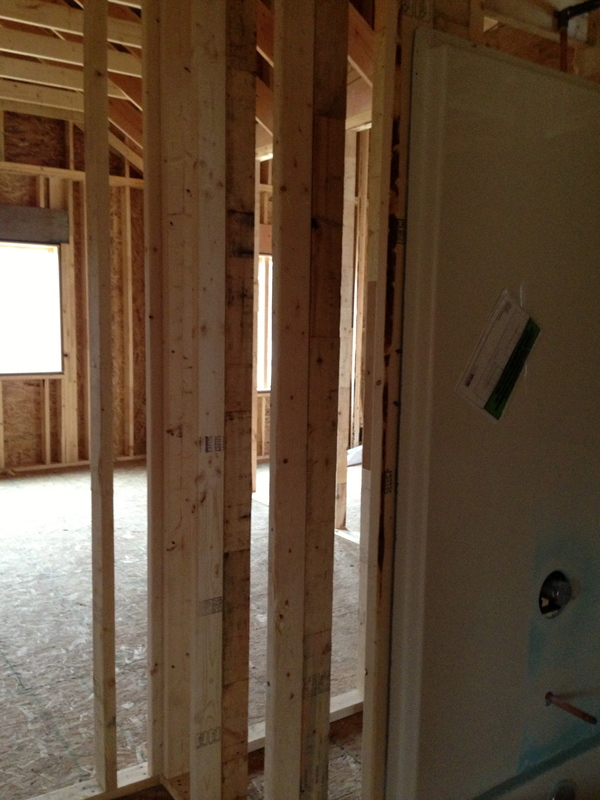 Board where the flat part of the vaulted ceiling would go in the master bedroom. And, this is what the shape will look like. Imagine drywall up there. We wanted some extra height in the master bedroom as we have a large wooden canopy king bed going in there without it feeling dwarfed. Time will tell! 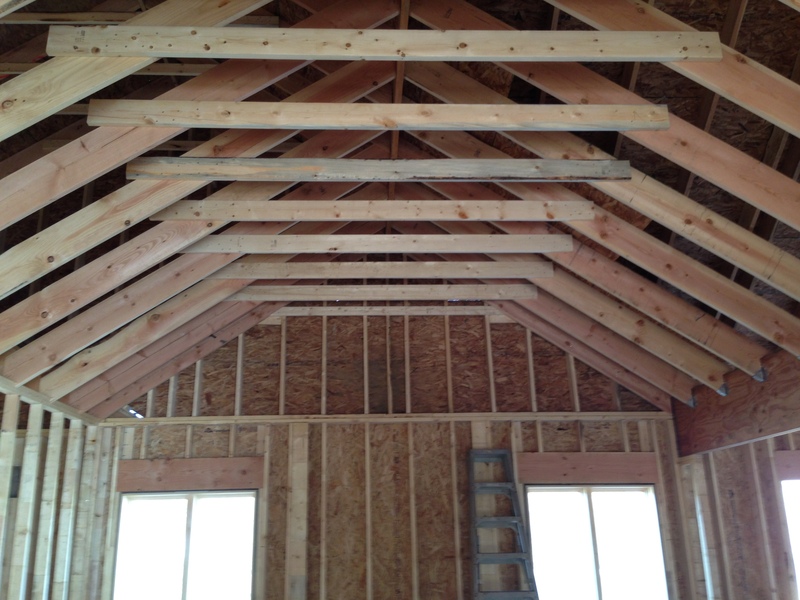 The other things on the framer’s list to complete on Thursday was the Family Room ceiling, the master walk-in shower bench, and building the fireplace structure. 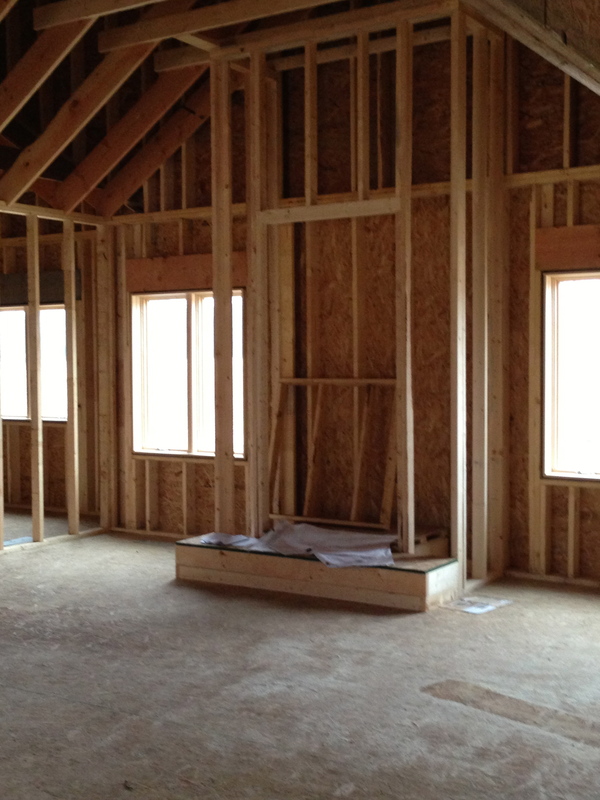 The Family Room flat section goes up to about 14-1/2 feet. 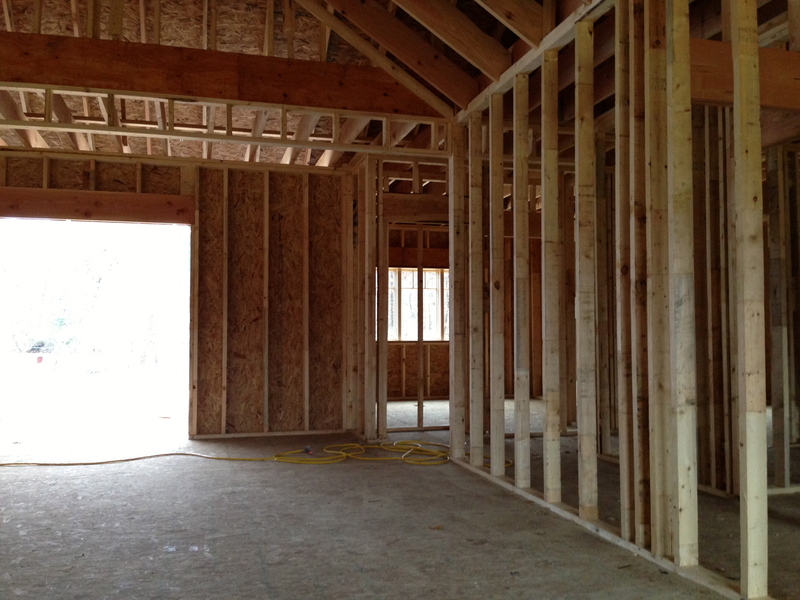 This is my favorite photo of the unfinished house so far. 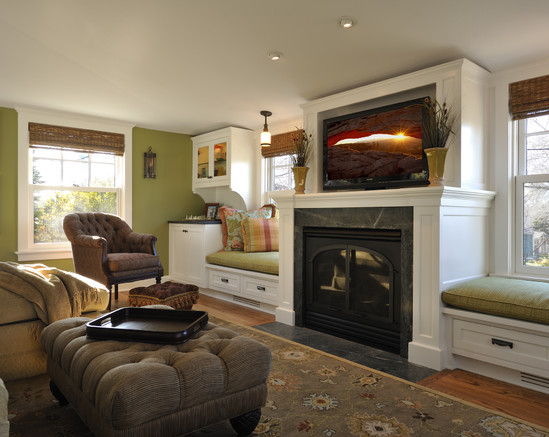 It’s the fireplace flanked by two eventual window seats and the vaulted with flat ceiling. I can’t wait to see how this will turn out cause I already like the shape it’s taking on. 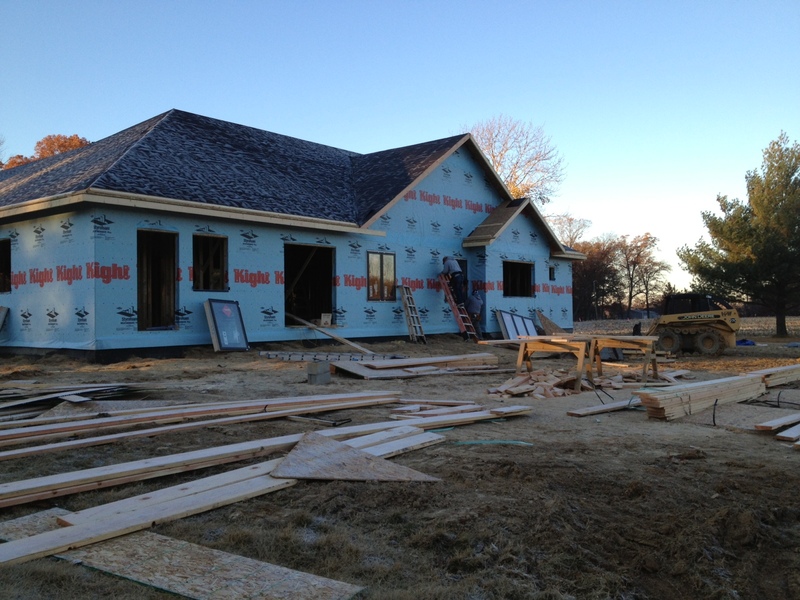 Friday, Nov. 15, the roofers and framers were hammering away in the very early morning. 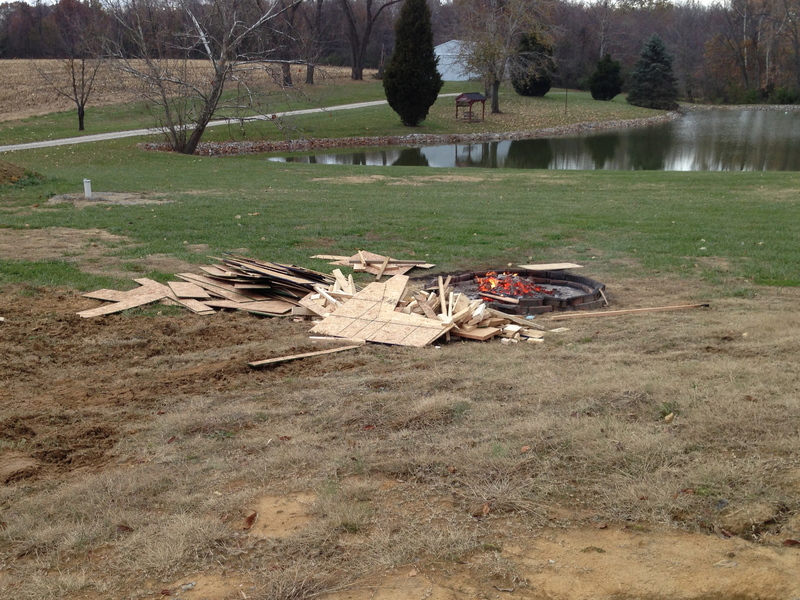 Bill picked up all the excess wood that he couldn’t use and burned away. 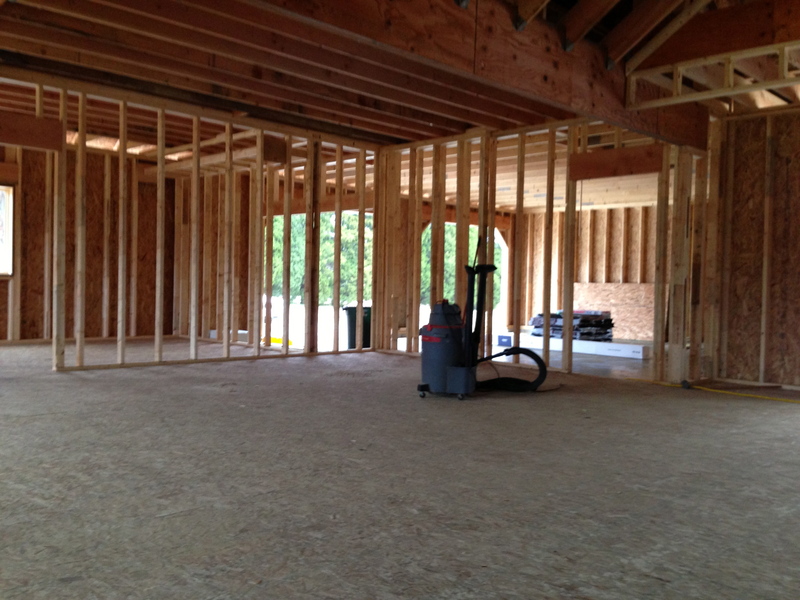 Saturday afternoon, Nov. 16, and Sunday, Nov. 17, Bill and I swept and vacuumed the interior of the house. We had to lay out, measure, and mark all the cabinets and appliances on the floor before the plumbers and HVAC guys came on Monday morning. It was a lot of work but also exciting to see if everything would fit the way we thought it should. Bill had built our cabinets prior to the house being framed, so we had to make sure everything was going to fit! Let me back up a little here. Thursday, Rick from Lensing (where we are getting our bathroom vanities/cabinetry) came to measure. 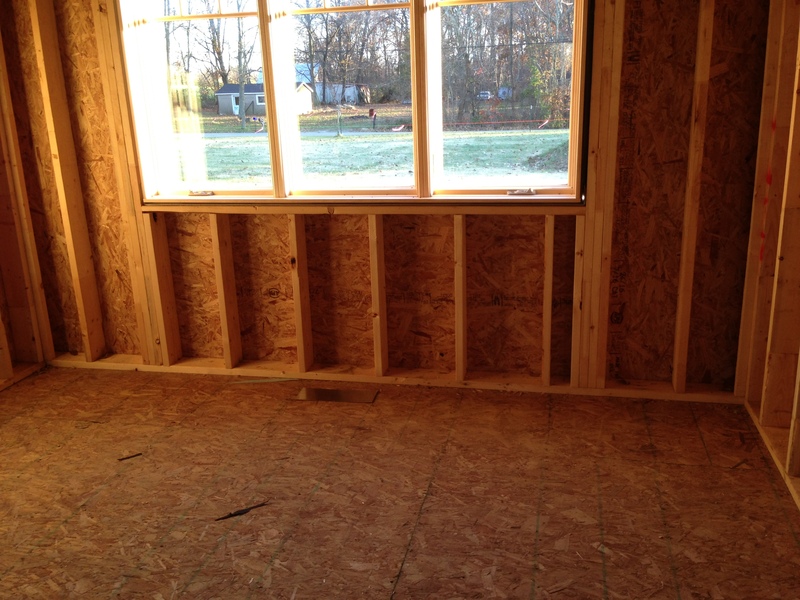 The framing wasn’t all complete (one of the walls for the window seat wasn’t done yet), but he came anyway. I wasn’t there. He told Bill that in our hall bath we would have to go with 18 inch depth cabinetry as there was not enough room for the 22 inch for which we had originally planned. 😯 Bill and I re-measured the bathroom during the weekend to see if it was framed correctly. We came up with the same measurements that were on our plan. How could this have happened? 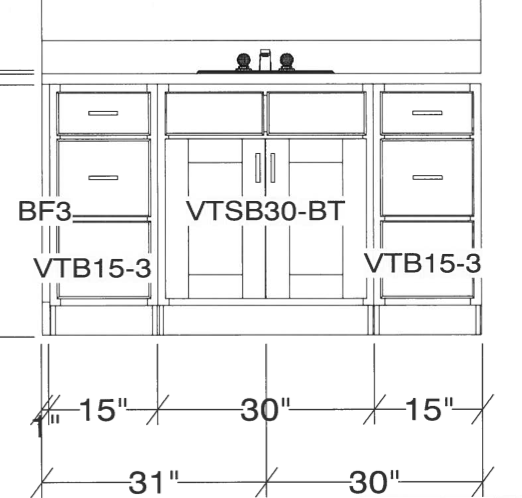 We knew the bathroom was going to be tight but I had 22 inch deep vanities in my 3D software and they fit and Jim had 22 inch standard vanities in his drawings. Something was off. The master bedroom closet was right behind this bathroom. I was willing to give up three to four inches if that wall could be moved. 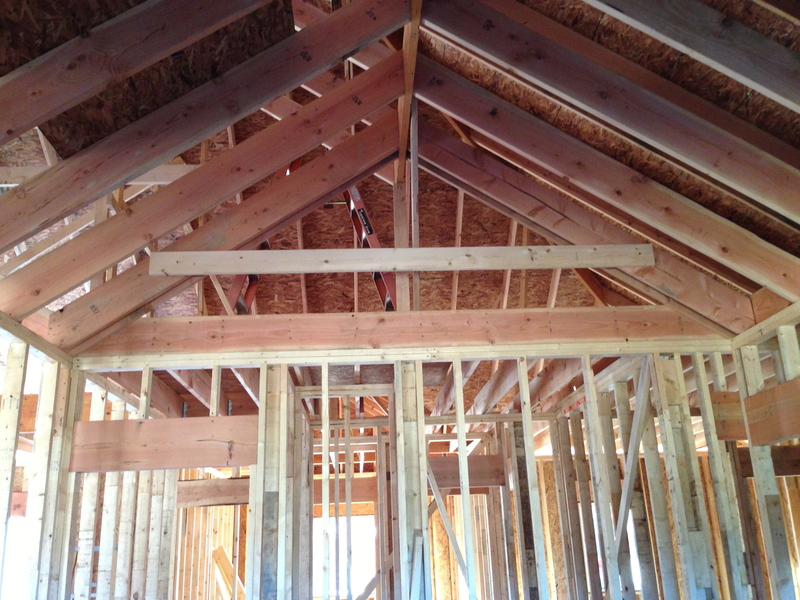 But, looking up, it appeared that the ceiling joists were laying right on the top of that wall. We figured it could not be moved without a lot of difficulty. Crud! I didn’t know what to do. I really didn’t want 18 inch deep cabinets. Jill said maybe we could go with a standalone furniture-like vanity if they came in that depth. Jill said she would talk to Jim and have him look at the bathroom and see if he could see what options we might have. In the meantime, Bill and I went out to Lowe’s Saturday evening and looked at 18 inch depth cabinets. There weren’t many but I thought if that is what we had to do, then that would be what we would have built. However, I would have to get rid of the full-size cabinet next to the vanity. It would close in the bathroom too much. Sunday, Jim walked through the house to see if everything was framed correctly. Jim, Sr. came over and we gave him his first tour of the house. 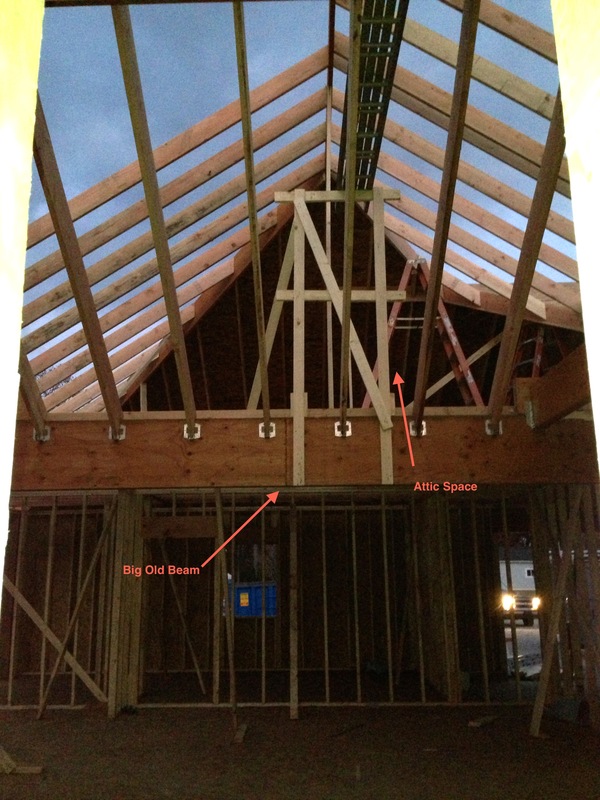 Jim, Sr. made a comment that our beam that separates the kitchen/dining area from the family room was one big beam! And, I kept looking up at all that space up there, saying that I guess we should have thought about that space before. You could stand up in that space. I verbalized to both Jims and Bill that maybe we should have put a room up there. I had mentioned the space to Jill earlier, too. Even if we gave up part of the laundry room to build a staircase up there, she asked if I would really want to go up there without a window? Jim said if we wanted to do something with the space, now was the time. My head was spinning. Should we make attic into a bonus room? Jim and Bill climbed up the attic stairs and walked up in the area above the kitchen and laundry. 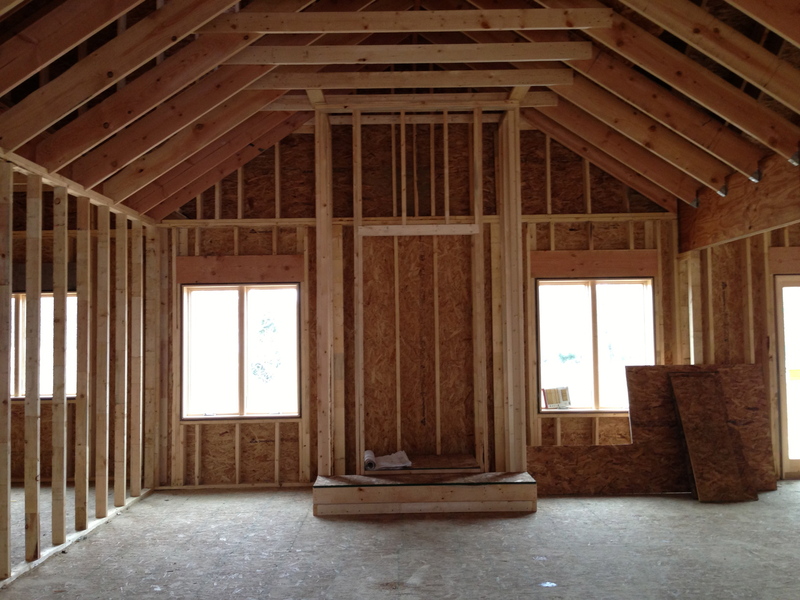 Jim finally said, yes there would be enough room to make about a 14×14 room with slanted walls. He then asked if we wanted to spend about $15-20K to make it happen. And, I still wouldn’t have a window! Finally, I said, it’s not worth it. I also said that soon the drywall would be up and I wouldn’t look up at it and wonder. Besides, Bill and I said . . . this house would have no stairs. And, I wasn’t willing to give up my laundry room. Once that was decided, we moved along. We had to see about that hall bathroom. The guys got to re-measuring the room and found that it was framed correctly. However, Jim discovered that the bathroom door had been placed in the wrong place. Jim said we had a couple of options. If we wanted to leave the door where it was and move the wall back into part of the closet space, we would have to check with the framer to see if the wall could be moved. 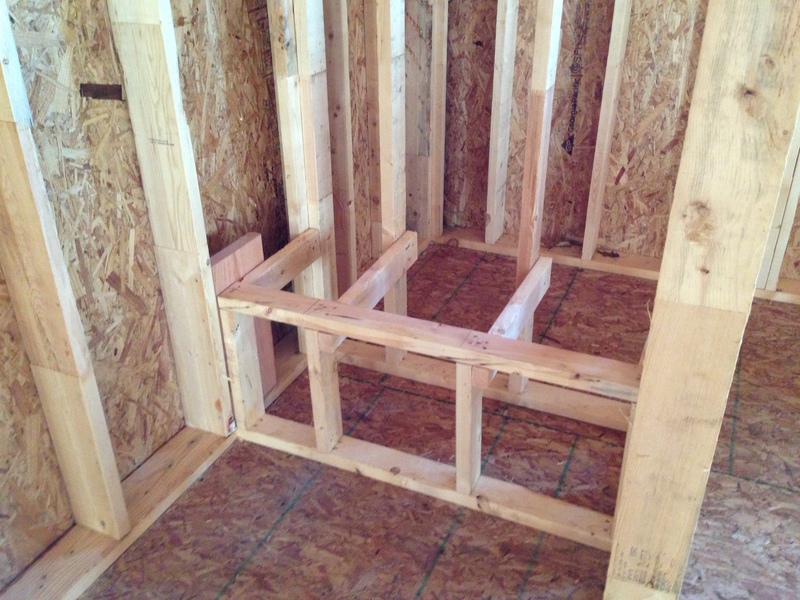 Or, the easier thing would be to check with the plumber to see how deep the tub enclosure was going to be so we would know how many inches to have the framers move the door over. Bill decided to check with the plumber the next day. Jim, Sr. said we really needed more support for that big old beam by the entry door from the garage. He said we didn’t want it to eventually sag. Bill discovered that the wall to divide the dining area from the family room was only 10 inches and it was supposed to be 2 ft 2 inches. Jim looked at the fireplace structure and asked Bill why the one support was so high up and then when Bill got out the instructions, they discovered a section had not been built. Bill said he would call Greg the framer later in the week to update him once we knew what we were going to do in that bathroom. Honestly, we decided that if these were the only things that were wrong in the whole house, we were in good shape. 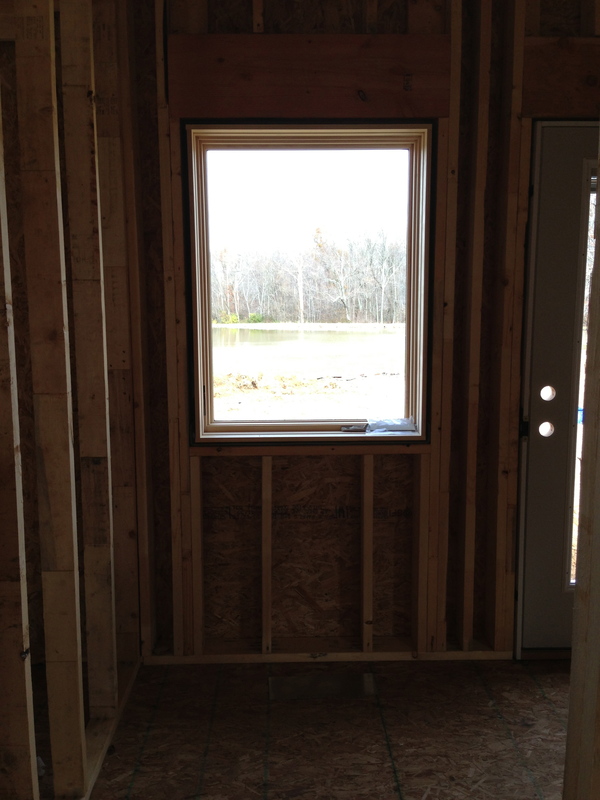 The framers had done an awesome job and we were pleased. And, Greg had told us he would be working close by and would come back and install the exterior doors as soon as they came in. These extras could be a “rainy day” for them. Monday, Nov. 18, the plumbers and the HVAC guy came. The HVAC left aluminum pieces to where he thought vents should go. Bill and I had to go through the house and move the vents to where we wanted them to be installed when they came back. Thank goodness I had already placed my furniture in our 3D house planning software so I knew where I could move the vents. I told Bill I wanted the vents by the window seats to be installed in the toe-kick of the window seats. Bill had never seen that before. I showed him this picture and said that is what I wanted. He will tell the HVAC guys when they return Monday, the 25th. 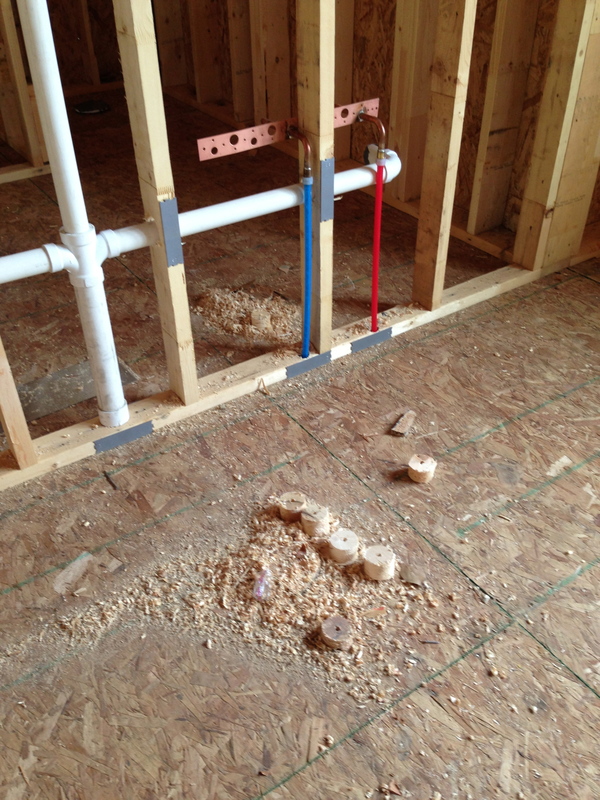 Here are photos of the plumbing work. The well guys came back out this past week, too, and trenched and installed pipe from the well to the house. The framers ended up coming back out and fixed all our tweaks and did it in two hours. 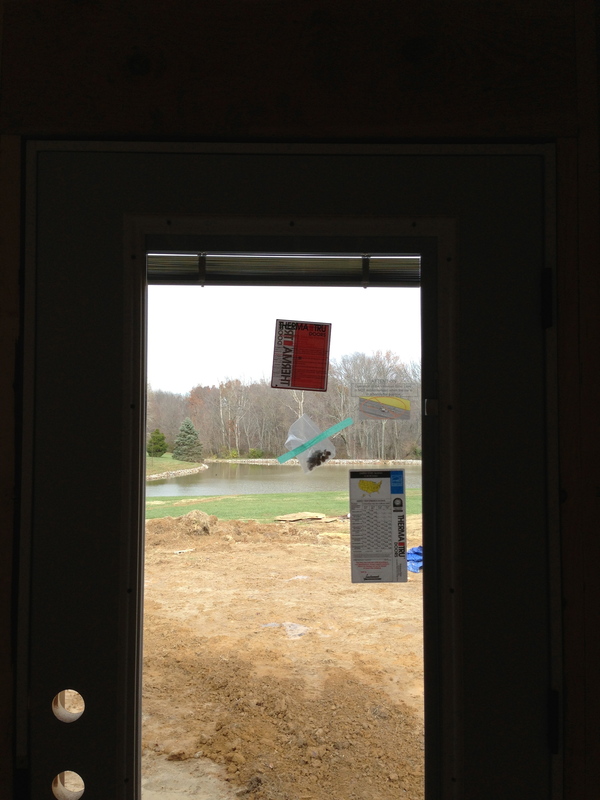 And, they installed our exterior laundry room door, too! Yay, Framers!!!! Installed a fake wall behind the linen closet wall so they could hang drywall. Yesterday, I ended up sweeping up all the piles the plumbers left throughout the house like below. Monday the HVAC guys are supposed to be back to make any exterior openings they need to do. 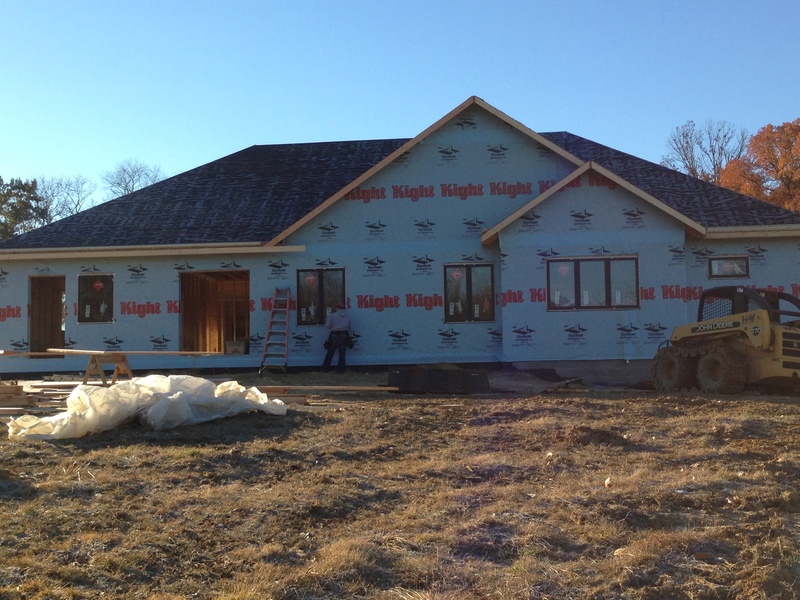 Because either Monday or Tuesday, the Hardie Board siding is being installed. Monday, I have Rick from Lensing coming back to do final measuring for the bathrooms and window seats so we can place the order. We’ve decided to go with the brandywine finish for the cabinets as it matches the mahogany Bill is using for the kitchen cabinets. The front door and the fireplace both got delayed. They were supposed to be installed this past week, but now both will supposedly be installed the week after Thanksgiving. I’ve spent some time looking at materials for the kitchen backsplash. We are getting closer to making that decision. I’m leaning toward glossy tan subway tiles. We also got our granite samples and they match real well with the cabinets and tile we picked out for the two bathrooms. And, I had to purchase another two light fixtures. I wanted to have a light for each of the window seats. 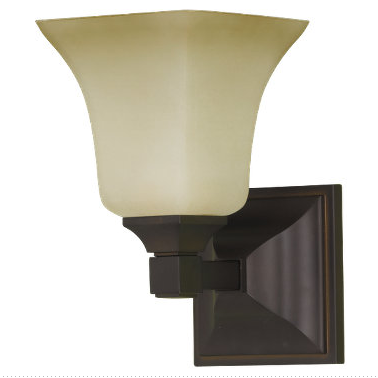 I order two more of the same sconces I had already purchased. 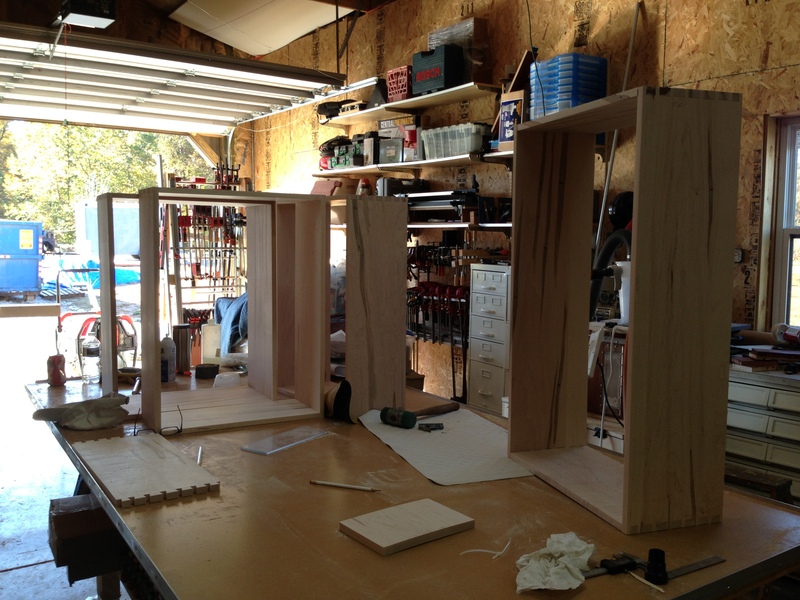 Two will be in the interior of the entry way and the other two will be in the window seats. And, I’m thinking I may just change the spot for the exercise bikes in the laundry room to my computer area. 😆 I’ll probably be on the computer way more than I’ll be on that bike. And, the view is so nice and I’d have my own space. We are taking each day as it comes and doing what we can to make decisions and adjustments. So far it’s all been GOOD! This blog post is going to be chocked full of photos. The framing crew did an amazing job since I last posted. 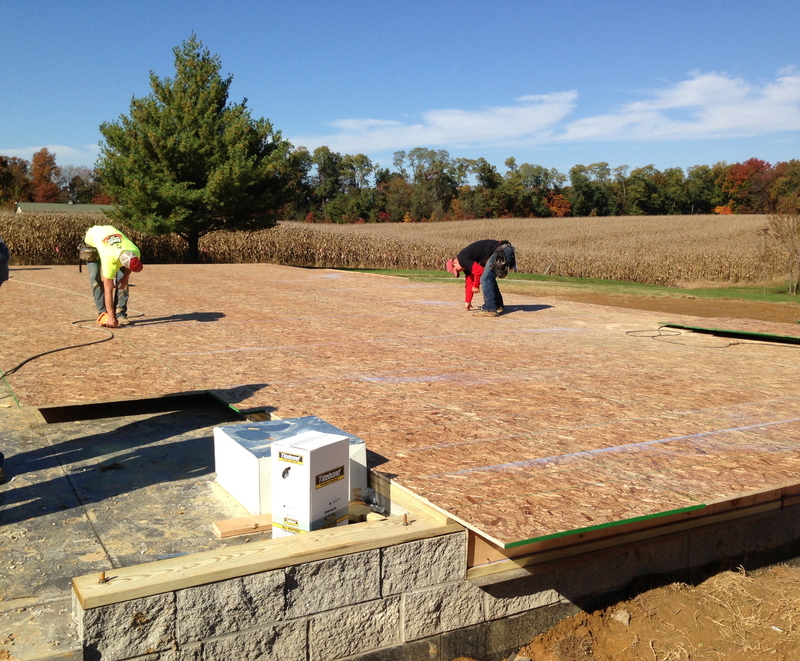 Friday, November 1, they concentrated on sub-floor installation. Ready to place down the board. Here’s what it looked like at the end of Friday, November 1. 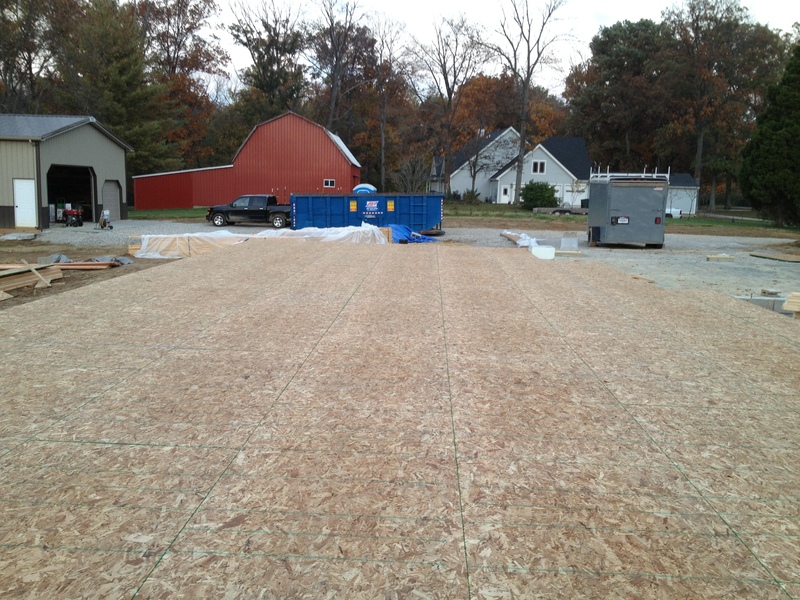 All of the sub-floors installed except a small area in one of the front bedrooms. I enjoyed walking on the flooring the next day. The floor plan was beginning to take shape. I could start seeing where different rooms would be located. 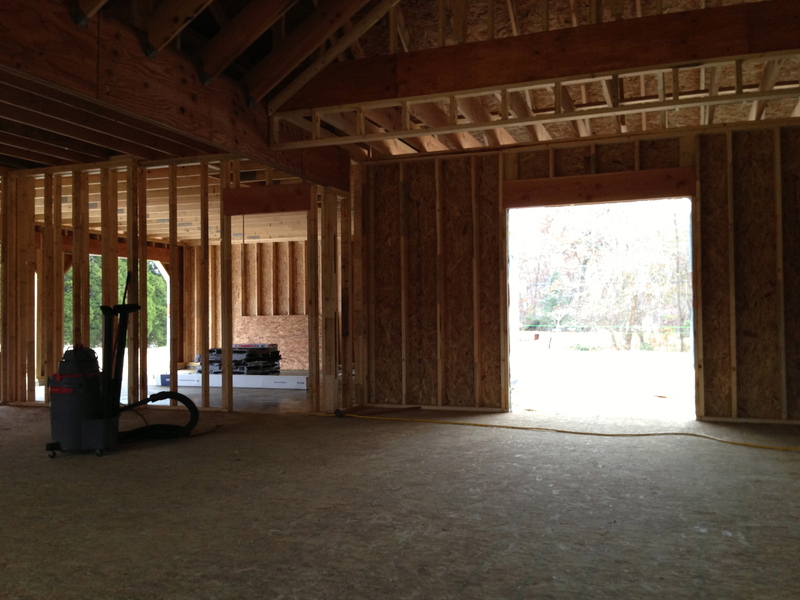 Looking from the front to the back of the house where you would enter from the garage. 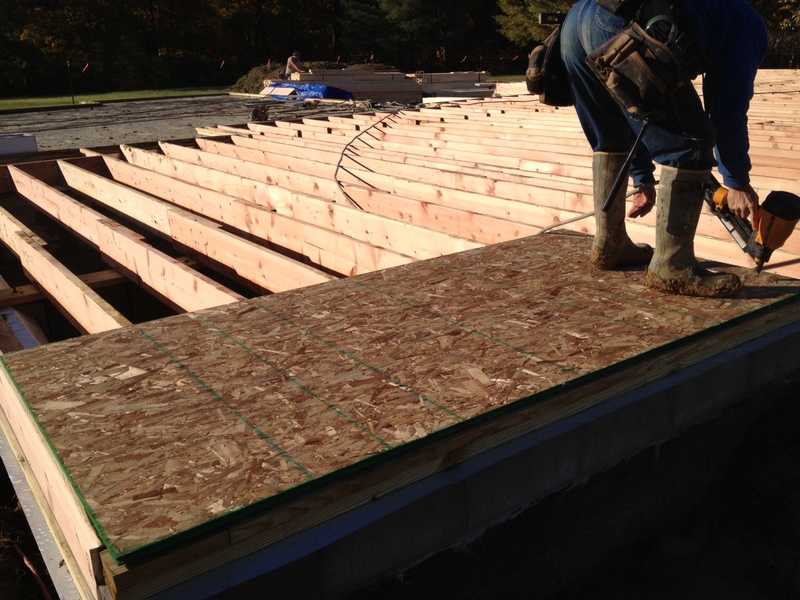 The framers glue and nail the floor boards. If you really want to take another step in making sure your floors don’t sag or hardwood floors squeak, you should screw the floor boards. Bill wanted that extra step. 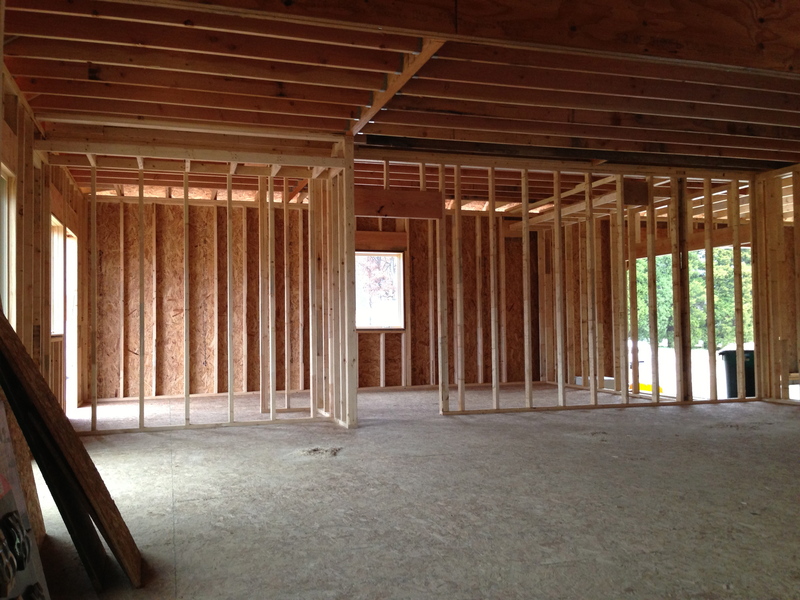 When Jill and Jim built their home, they had the construction crew screw the floors after the framers were done. There are no members of the construction crew any longer. If we want extras done, we either pay someone to do it or do it ourselves. Well, not “us.” It’s always Bill. Here was another PITA job. 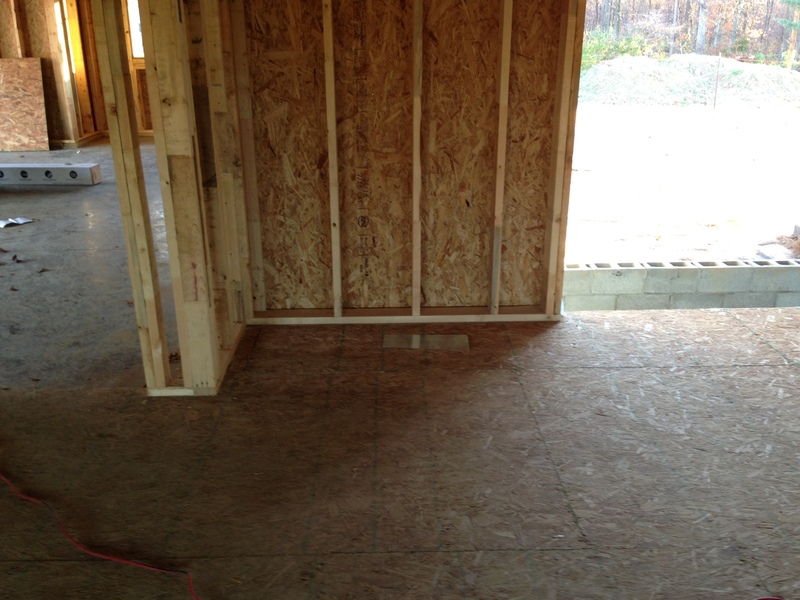 Bill talked with Greg the framer about screwing the floor boards and Greg said he had a screw gun that Bill could use. 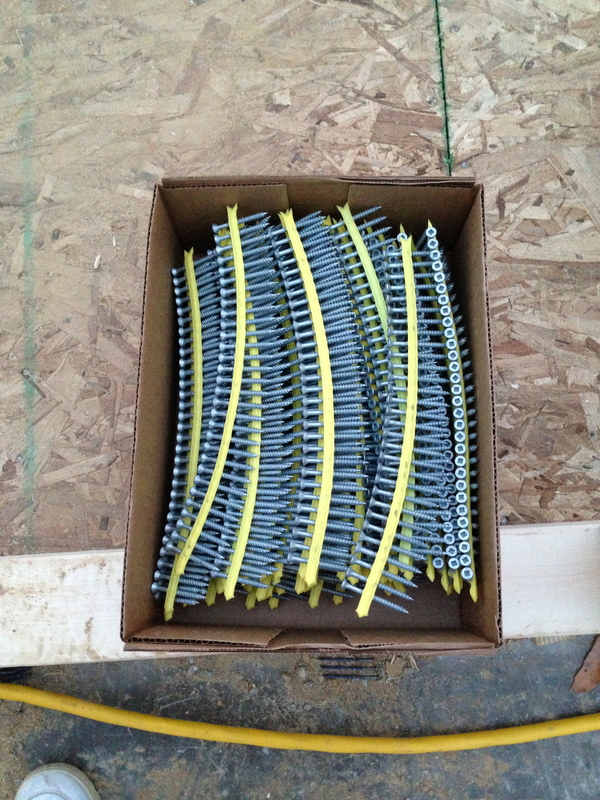 Bill ordered the screws from the lumber company and they delivered them the next time they came out. 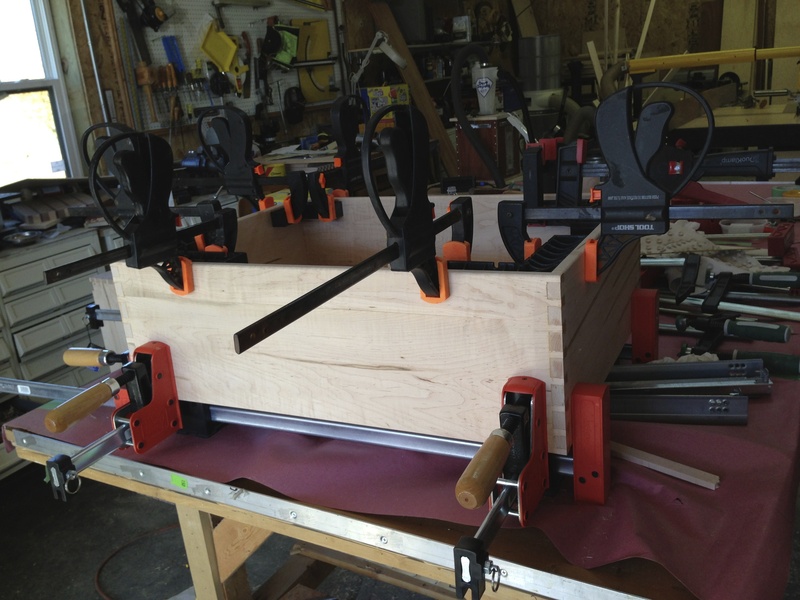 In between his shared General Contractor job, Bill worked on cabinets. He put the drawers together to make sure they all fit. Monday was the day I was looking forward to watching the framers. It was the day that walls would be built. 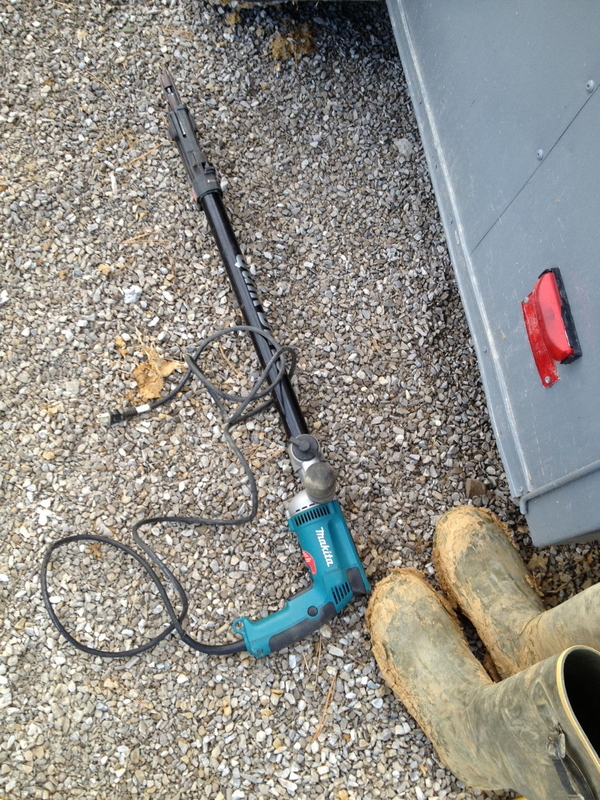 I decided to spend the day down at the pole barn watching. I was so excited! 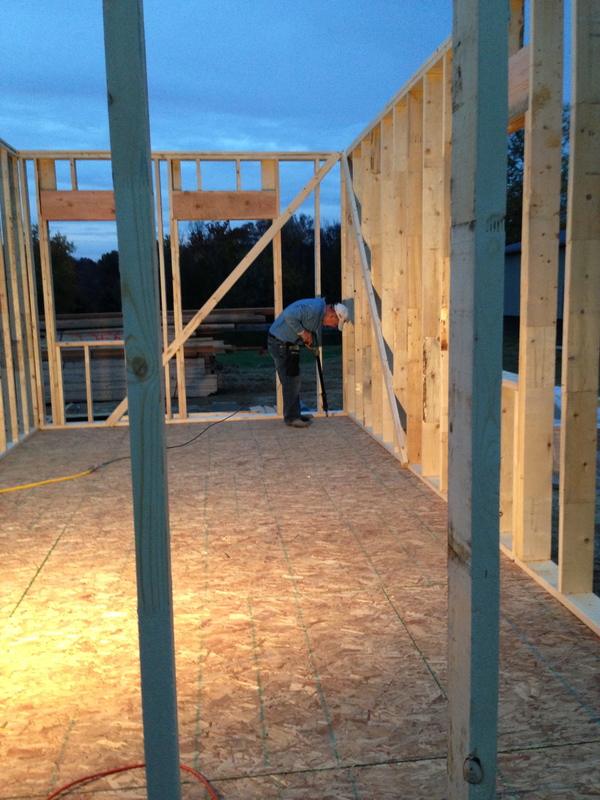 Since we had the time change early Sunday morning, the framing crew told Bill they would be ready to work EARLY! He went down to the pole barn at 6:00 am to open it up and get out any of their supplies he was storing for them. 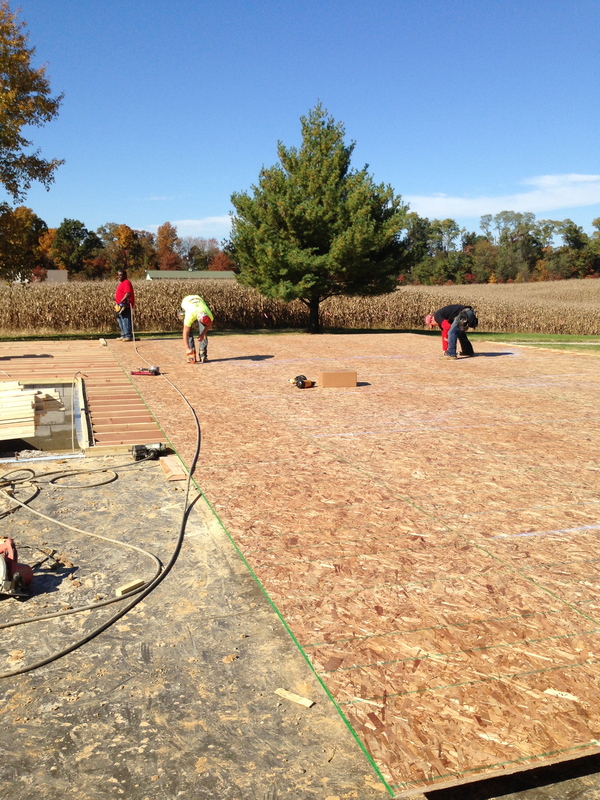 Bill said it would be awhile before they would work on any walls as they needed to finished the floors first. I told Bill to text me when he thought the walls would start going up. At 9:00 am, Bill sent me this pic via text and it said – Walls!!! It was a cold morning but Bill let me use the heater because we had the garage doors open. I loved watching the framers from my chair in the pole barn. Here are some pics of how the first couple of walls went up. 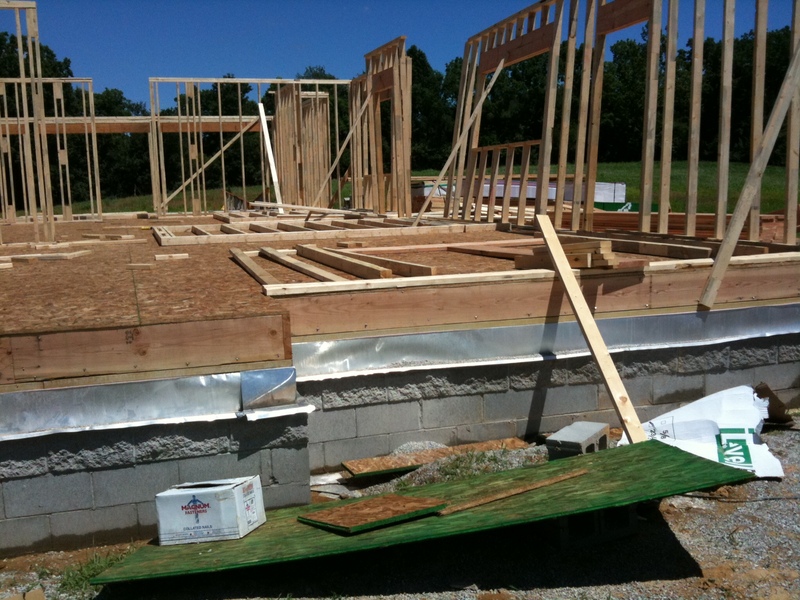 The framers would measure and cut and then nail the structures together while they were flat on the floor. Then they would lift the walls and nail them in place. Then they would nail another 2×6 to something else to make sure the wall didn’t fall. 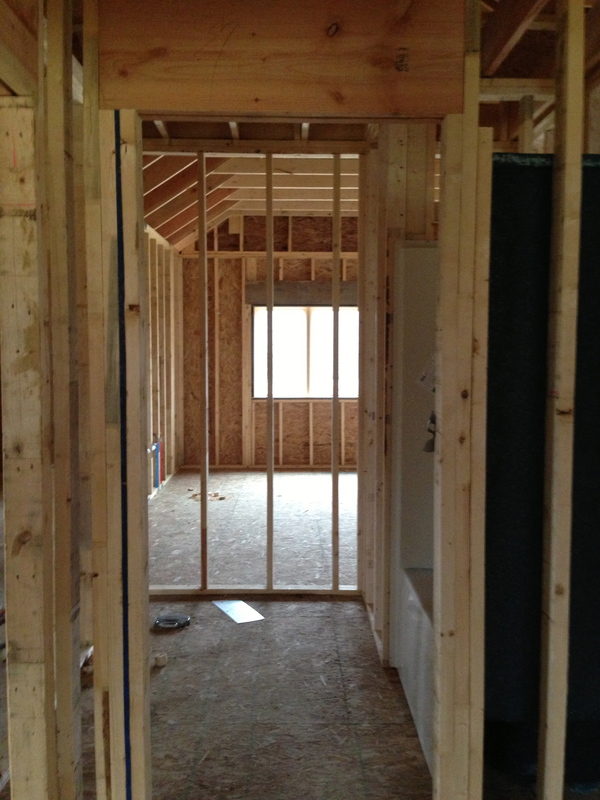 Here is a set of photos showing the master bedroom and master bath walls going up. That was impressive! It took all five members of the crew to lift that wall. It was the family room wall with the two windows flanking the fireplace, then the dining room with door, then the laundry room wall with door. The guys worked together to get it totally squared and in place. Greg was at one end and was calling down to the guy at the other end. He asked, “How is your end?” The guy said, “It’s almost perfect.” Greg said, “What do you mean almost perfect? Do you think Mr. Rogers wants to install his almost perfect cabinets on an almost perfect wall?” Everyone laughed. I like Greg. After they nailed the wall in place and I had time to sit and look at the wall, I noticed that something was wrong! 😯 I called Bill over and said, “Honey, there is a window missing in the laundry room next to the door.” He looked at me and said, “Are you sure?” I said, “Yep. 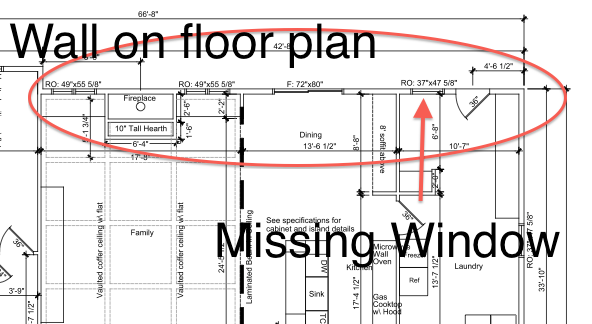 Let me show you on the plans.” I told Bill I know the floor plan backwards and forwards. Bill went to talk with Greg to tell him about the missing window. They both looked at the floor plans Greg had and said he’d get that fixed. 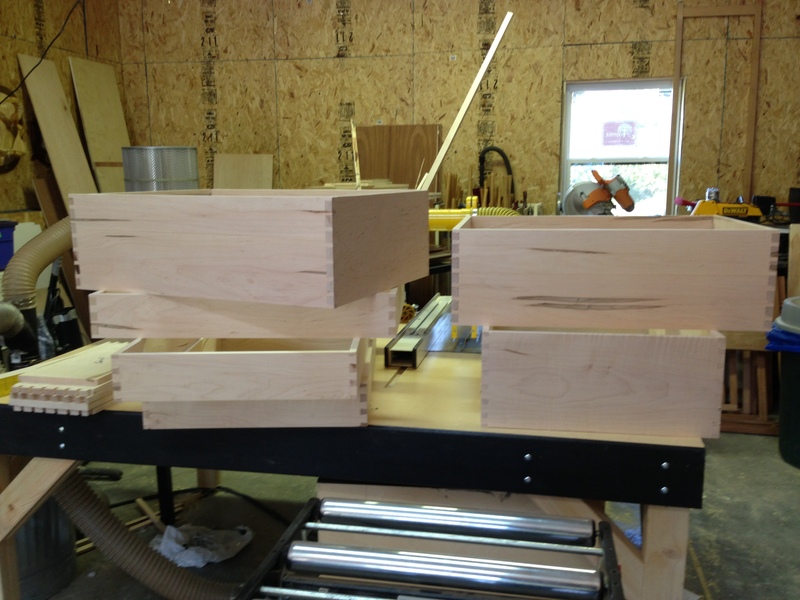 Shortly afterwards, some of the 2×6’s were removed. While Bill and Greg were looking at the floor plans, Bill noticed that Greg didn’t have the correct measurements for the fireplace. That was along the same wall. They talked about a solution of how to fix the windows on each side of the wall that was already up. Greg said if he extended the fireplace a few more inches which was needed and he left the windows where they were they would not be symmetrical in placement to the fireplace. Bill had me come over and discuss if it would bother me or not about the windows. It was going to be 1-1/2 to 2 inch difference of showing drywall on one side. Bill said it wouldn’t bother him. I said I guess it was too little a difference to bother me. However the next day we talked with Greg again about the situation because the more I thought about it, the more I knew it would bug me. He said he’d re-do that part of the wall and make the window placement symmetrical. Thank you, Greg! 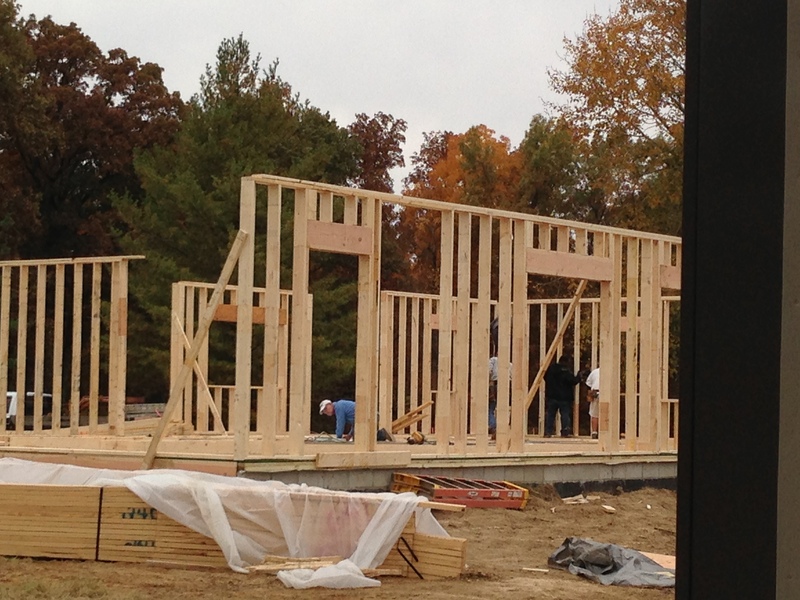 By the end of Monday, all the exterior walls were installed and some of the interior walls were up. Bill decided to start screwing the sub-floor that evening. 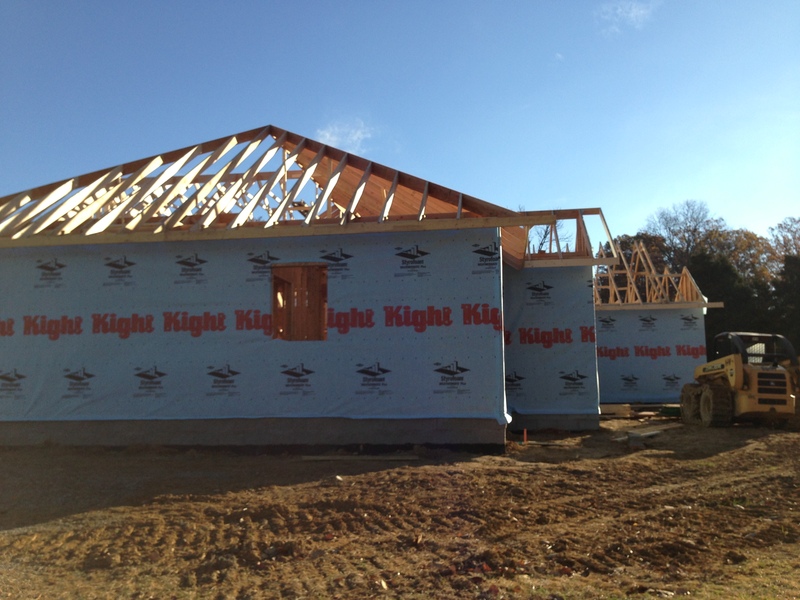 The framers were able to work a full day on Tuesday, a couple of hours on Wednesday morning before being rained out, and full days on Thursday and Friday. It is so much fun walking through the rooms that only a couple of days before were only on flat paper. Here are pics of the everything built by the end of Friday, November 8. 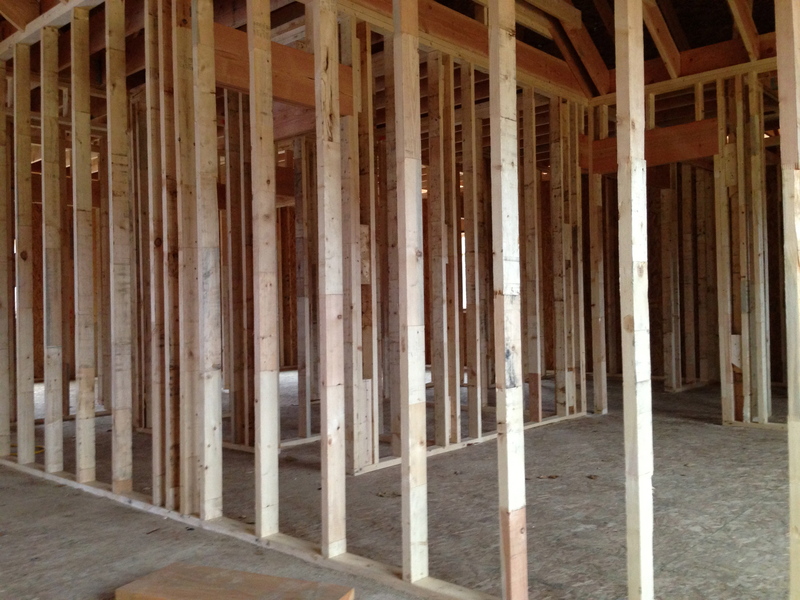 I spent a lot of this weekend measuring the walls and rooms in the house to make sure everything was good. Especially the walls where Bill had built cabinets. These guys are great. If there was any difference (which there was only in a few places) the measurement difference was only off about 1/4 to 1/2 inch. Almost everything was spot on. By the way, Bill did finish getting all the floors screwed. Another PITA job done! 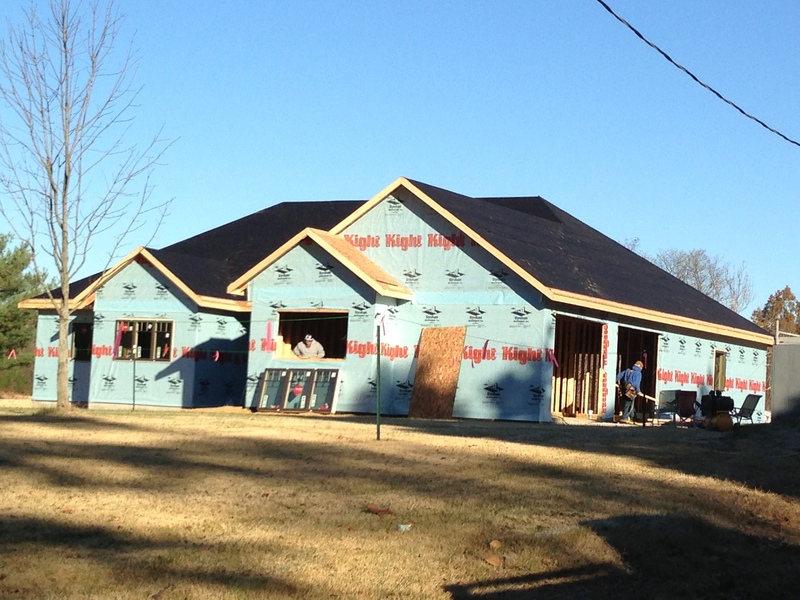 Can’t wait to see how the house looks once all the gables and roof are on. What a difference a week made!